A great way to get kids started with skating lessons. This is a session designed to give children of all ages a chance to learn to love skating. Playing games and having fun is an easy way to learn the skills they need to move to Canskate. The Preschool program gives first time skaters of any age an opportunity to learn the basic elements of skating. Group instruction of 30 min. with a professional coach is offered twice a week. 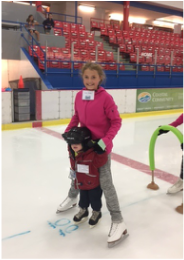 This is the "Learn to Skate" program certified by Skate Canada for beginners of all ages. Participants are evaluated on a session to session basis with no formal testing days required. Canskate sessions are 45 minutes in length and are offered twice a week. Skaters are grouped according to their skating ability. This program is taught by our three club coaches and assisted by Program Assistants. 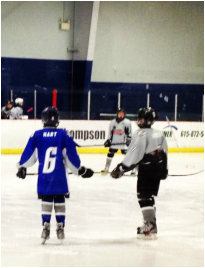 Group instruction with one of the professional coaches is included with each Canskate session. Canskaters will learn skill development in a variety of ways including circuits, games and creative expression exercises. This introductory program, geared to hockey players 5 - 7 years of age, has been designed to teach basic skating skills and technique in a power skating specific environment. Skaters in this program should have completed at least level 2 of the Skate Canada CanSkate program or equivalent. CanPowerSkate is an action-packed, high energy instructional power skating program geared to hockey skaters that focuses on balance, power, agility, speed and endurance. Skills, techniques and conditioning drills are taught in a progressive format that emphasizes how the skills apply to game situations. It is an excellent complement for those athletes playing on hockey teams.